'Mighty Jack and the Goblin King' review: Jack and the Beanstalk meets Henson's Labyrinth – AiPT! Kids and their parents alike will enjoy Hatke’s work. Ben Hatke is back with the sequel to Mighty Jack as he continues to build this fantastical universe. I personally loved the first one, but is Mighty Jack and the Goblin King good? 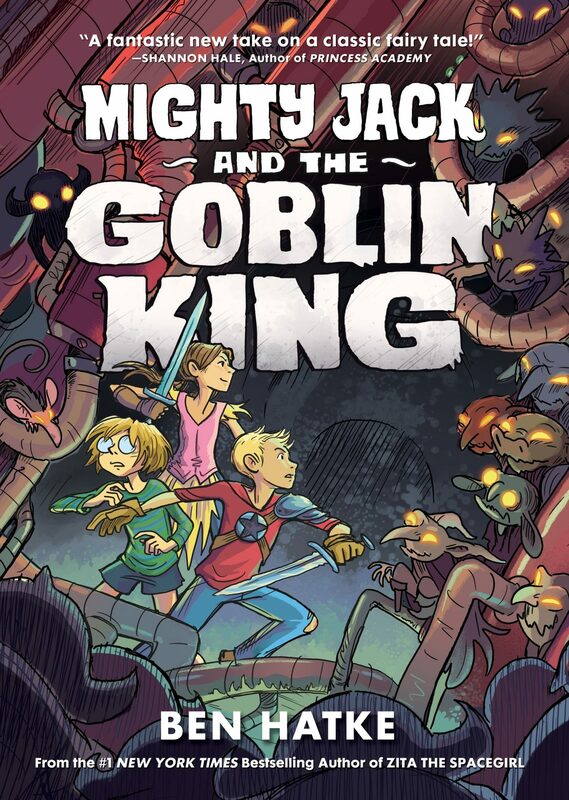 The first Mighty Jack installment was a nice interpretation of Jack and the Beanstalk with some slight variations in the storyline, the addition of some modern elements, and some top-notch artwork. In this book, Hatke continues to distance his narrative from the original fairy tale as he introduces us to a fantastical world above the clouds. The main storyline is divided between Jack as he continues to pursue his sisters’ captor and Lilly, who is separated during battle and taken to the Goblin kingdom. You could still get a kick out of this book without reading the first, but it would certainly be more enjoyable based on the relationships you’ve built with the characters. While the first book did a great job of setting up the narrative, this second book contains a lot more action and otherworldly elements that could easily be found in any child’s imagination. Between knights, giants, goblins, dragons, and magic, I don’t know what kid couldn’t find something to enjoy about this series. However, the most important thing that Hatke includes in this book is the quality characters. Jack and Lilly speak and act like authentic children and provide good role models for children. Hatke is also able to balance the introduction of mature concepts while simultaneously piquing juvenile interest. I applauded the last book for being great to have in a classroom because it allows the opportunity to spawn so many important conversations such as cause and effect, empathy, and acceptance. Hatke continues to incorporate positive messages within his work, with Goblin King containing a theme of female empowerment as seen with Lilly’s character. While the book may be called Mighty Jack, Lilly has proven to be the strongest character in the novel and is a great role model for young girls. Hatke does a great job writing her character as a strong, caring girl without crossing the line and giving her masculine qualities. Many writers sometimes mistake masculinity for strength, but that’s certainly not the case in this book. I’m still impressed with Hatke’s ability to write a quality novel and do illustrations on this level. As we all know, kids are drawn to books based on the cover and the quality of illustrations, so as much as I praise the characters’ qualities and interesting storyline, it means nothing to a ten-year-old. Luckily, between Hatke’s pencils and the eye-catching colors provided by Alex Campbell and Hilary Sycamore, children will flock to these books. My copy of the first book has been passed around my classroom from student to student and has ultimately opened the door to graphic novels to many of them. I’m sure this sequel will have the same effect. This second installment of the series really starts to deviate from the original fairy tale to create something truly original. The Goblin King has the loose structure of Jack and the Beanstalk with the fantastical element of Henson’s Labyrinth. Both kids and their parents will enjoy Hatke’s work and will most likely leave you excited for the next book. This second installment of the series really starts to deviate from the original fairy tale to create something truly original that both children and adults can enjoy.